Songwriting tips from some of the finest songwriters around. Click HERE to visit Ben's website. During the sixties and seventies Tony Hazzard wrote hits for bands and artists such as Manfred Mann, The Hollies, The Tremeloes, Lulu, Hermans Hermits, Cliff Richard and Andy Williams and his songs were often found in the upper reaches of the Top 40. Tony has also written and produced television jingles and theme tunes for BBC and ITV, and one jingle won an award at the Cannes film festival. Tony also appears as a session singer and guitarist on several records, including three Elton John albums. Tony appeared on stage with Elton at his Royal Festival Hall concert. 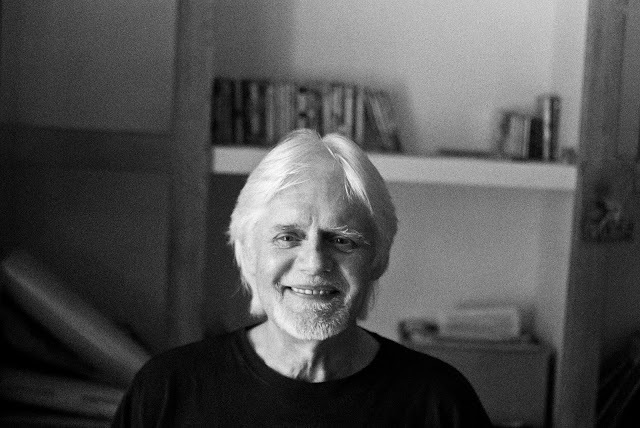 Tony has released 5 solo albums, the first in 1969, and the most recent 'Songs from the Lynher' in 2011. Here he shares his songwriting tips. Do you have a daily songwriting routine or do you wait for inspiration to strike? No routine. I suppose I really should, but I’ve never been that kind of songwriter. I remember in the sixties I had professional songwriting friends and acquaintances who would work office hours and write all day. They might write several songs in a day but many would be discarded. I always wrote infrequently when I felt the urge or an idea came out of the blue. After my first hit (‘You Won’t Be Leaving’: Herman’s Hermits) I dried up for a year, writing little of consequence until ‘Ha Ha Said The Clown’ a year later. Do you have any tricks to get the creative juices flowing? I’ve tried alcohol! Sometimes it acts as a lubricant but not often. You think it’s going to but it often disappoints. A few glasses of wine can sometimes drive you to pick up the guitar and start noodling and the embryo of a song can come into being. I prefer to let it happen of its own accord. Do you find you normally start with a melody or lyrics? I used to get asked this at parties: “Which do you write first, the words or the music?” There was never a clear answer. Sometimes it was the title. Sometimes just the idea, or a phrase that someone had written/spoken. If I had to choose I would say that sometimes a melody and chords start to emerge after some guitar noodling. It might be the start of a verse or a chorus, but it would give a vague idea of how the song was going to pan out. After that would come the process of filling in the blanks and changing bits so it flowed well. Do you think that melody is the most important aspect of a song? No clear answer, again. Sometimes it’s hard to separate the song from the recording. Little Richard’s Tutti Fruiti is a good example. It’s not the greatest melody in the world, and the lyric isn’t a Shakespeare sonnet, but it never fails to fill me with joy, mainly because of the sheer exuberance of Mr Penniman with that melody and that lyric. Old-school songwriters would say the most important thing is the ‘hook’. My first publisher was always asking “Where’s the hook?” I’ve always loved a good lyric married to the right melody and have prided myself in my lyric writing, despite knowing that many people couldn’t care less about the words. How long does it take you to write a song? It varies. ‘Ha Ha Said The Clown’ took about six weeks to write: it was a tricky one. ‘Me, The Peaceful Heart’ (Lulu) was comissioned, written and demoed within a week. Sometimes the basics come together in an evening and then fleshed out over the next few days. I started one song in 1983 and didn’t finished it until 2011! And I’m still tinkering with the lyric! Could you explain a little about the writing process behind a few of your songs? My best known songs are probably ‘Ha Ha said The Clown’ and ‘Fox On The Run’; however I’ve been asked to write about these for a book entitled ‘The Stories Behind The Songs’ so I’d rather leave those out. ‘You Won’t Be Leaving’ was the first hit I had, recorded by Herman’s Hermits, and produced by Mickie Most. The inspiration came from someone I’d met at university. The pictures and room mentioned in the song were real, as was the person, but the overall tenor of the song was fantasy: she didn’t stay the night! The melodic idea for the hook line came from a song by The Seekers, entitled ‘I’ll Never Find Another You’ which was a big hit. That song starts with a 12-string riff, followed by a classical guitar riff over three beats. It’s over in a flash and you have to listen closely to even notice it. That three beat riff caught my attention and became the melodic inspiration for the phrase “I’ve got a feeling you won’t be leaving”, and also for the guitar intro, both being the hook line in the song. One note of interest is that the first verse doesn’t rhyme at all. When I’ve tutored on songwriting courses I’ve always emphasised metre over rhyme. ‘I Think I’m Over Getting Over You’ was inspired by a relationship that was officially over but wasn’t really. Again, on songwriting courses, I’ve emphasised the importance of trying to say the commonplace in a different way. There are plenty of songs about getting over someone after a relationship has ended, but I wanted to turn it on its head and say “Well, I got over you but actually I’m still thinking about you and it feels good, so maybe it hasn’t really ended”. The inspiration for the song came when I was on holiday in Deia, Majorca. At the time it was a little known village in the mountains on the north of the island, although known as the former home of the poet, Robert Graves. I wanted the whole feel of the song to encompass the warmth/relaxed life/sea/abundance of lemon trees and this clearly shows in the lyric. In the bridge there’s a reference to a line from an ode by the Latin poet, Horace (“the walk, the quiet talk with friends at sunset”). It was originally pitched to Art Garfunkel but apparently he didn’t like a line in it (“like her, I’m indescribably blue”) so Andy Williams recorded it instead. Also, Peter Noone, and I recorded it. The best version was by an Italian woman. This is my version, featuring Glen LeFleur on drums, and BJ Cole on pedal steel, both then playing with Elton John. String arrangement by me. ‘Take To The Mountains’ was recorded by Richard Barnes in 1970. The subject of the song was the same as in ‘You Won’t Be Leaving’. She eventually emigrated and the song is about the feelings left behind when someone goes out of your life. The first verse begins: “I remember golden days: autumn falling by the river”. There’s a lot happening in this line. The river exists. ‘Golden days’ has two meanings: 1) treasured days in the past, and 2) the days of autumn when the leaves turn to gold. There is also a poetic conceit, whose name escapes me, in the phrase ‘autumn falling by the river’. Obviously it’s the leaves that are falling but the whole process indicates autumn. The melody lies over a typically descending bass line. There is another bit of word play in the second verse, where the lyric uses the word ’take’ in two different ways: 1) take for example, and 2) remove. By the end of the second verse you realise that it’s actually an arithmetical excercise. The melodic writing began with the introductory guitar riff over the descending bass and developed from there. What songs that other people have written do you particularly admire? There are so many, so I can only mention a few: ‘A Case Of You’ Joni Mitchell, ‘And So It Goes’ Billy Joel, ‘Hasten Down The Wind’ Warren Zevon (I told him I wished I’d written it), ‘Heart Like A Wheel’ Anna McGarrigle, ‘Willin’’ Lowell George, ‘We Can Work It Out’ Paul McCartney, ‘Knee Deep’ Zac Brown Band, ‘Texas Girl At The Funeral Of Her Father’ Randy Newman, ‘Father And Son’ Cat Stevens, ‘Sand And Water’ and ‘Time Won’t Tell’ Beth Nielsen Chapman. I could fill the page, there are so many. Do you think that a technical knowledge of theory is important or does it get in the way? If you’re going to write in Spanish it helps to know some Spanish. I think some basic musical knowledge is useful, especially if you’re writing with someone else. Then at least you can speak the same language, even if it’s only chords and chord structure. I did know someone who wrote songs who didn’t know anything about music and couldn’t sing. He paid me to interpret his ideas. He would ‘sing’ the line and I would try and clarify what the melody was and what chords to use, but it was a painful process. I don’t think musical knowledge gets in the way. Do you tend to revisit your songs and rewrite them? I had to rewrite a lyric completely once (it was considered too saucy in the mid-sixties). I also added a third verse to ‘Fox On The Run’ long after it was first recorded. But generally speaking, no. Do you write songs with a view to being commercial and following current trends? No. Never have done, despite the hits. When I wrote those I wrote what I wanted but, being a professional songwriter, I also wanted the songs to be recorded, so I guess commerciality in some form was built in, albeit unconsciously. When I went on to record my own albums I moved further away from any hint of commerciality. These days I write whatever pleases me. Have you done much co-writing, and if so what do you see as the benefits? I’ve tried twice but it never worked out. The first time (with Neil Innes) we just drank wine and didn’t write anything. The second time (with Roger Cooke) I was called away to an emergency and we didn’t get around to trying again. I’m a bit of a lone wolf when it comes to songwriting. However, I can see the benefits: someone to bounce ideas off, someone to encourage when it’s hard going and then keep you in check if your idea isn’t really worth developing, someone to stop you being lazy. Who do you view as great songwriters. Who has inspired you musically/ lyrically? There are many great songwriters in the thirties and forties, but if I focus on writers from the fifties onwards, I would say Randy Newman, Billy Joel, Jimmy Webb, Buddy Holly, Boudleax & Felice Bryant, Lennon & McCartney, James Taylor, Jackson Browne, The McGarrigle sisters...I could go on... I think in terms of inspiration musically and ‘feel’, probably The Band and Ry Cooder. Do you feel that when there's conflict/struggle in your life that it inspires better songs? Not necessarily. I’ve found that in difficult times my creativity has been lacking. William Wordsworth said that poetry was ‘emotion recollected in tranquillity’ and I think the same can be said of songwriting for some songs. I sang a new song at a songwritng workshop and someone said that the song had obviously been inspired by deep emotion. I said no, it was created from my imagination! People forget that sometimes you simply use your imagination. I have used situations, people, phrases people come out with, as foundations for songs. A novelist might use autobiographical references in his/her novels but they might equally be entirely made up. Same with songwriting. But I can think of some of my songs that I find hard to sing now because they were written about deeply emotional situations and I get too afffected by them. It varies. Do you have any idea where you ideas come from? Clearly some ideas are plain to see/hear. Someone once said to me: “I keep walking round corners and bumping into emotions” and I jumped on it and wrote a song called ‘Walking Round Corners’. Another person said: “My days don’t belong to my nights anymore”. It just takes a phrase like that to set you off on a writing spree! Other times I haven’t a clue where ideas come from. It’s almost as if they’re floating around somewhere/somehow and they float into you like a soap bubble and you write them down: it’s a gift in both senses of the word. When I wrote ‘Take To The Mountains’ I’d only written the first two verses and the chorus. I got a call from the producer saying they had recorded the backing track and were about to record the vocal and please could they have the second set of verses. I sat down at my desk, concentrated, and the words just came, and the result was some of the best lyric writing I’ve done. Do you have any advice you'd like to share with budding songwriters out there? I’ve been asked this before and my first response was “Train as a plumber. At least you’re guaranteed a paid career”. Despite the so-called democracy of the internet, it’s harder to work as a professional songwriter unless you’re extremely lucky, which is why so many writers are giving their work away on free sites. However, I would say that if you just want to write songs for the love of it, then listen to good songwriters: listen to how the melodies interact with the lyrics; listen to interesting chord sequences, like the bridge in Sleepless Nights by F & B Bryant (see above) recorded by The Everley Brothers. Read poetry and find phrases which catch your attention and try to work out why they do. Focus on metre at the expense of rhyme, if pushed. Try to write what’s been written a thousand times before but discover how to write it differently. Think differently. Find your own style and voice. Click on the following to find Tony on the web. This interview was by Ben Williams. Find Ben on TWITTER, FACEBOOK .